Future proof your indoor deployments with the compact, low profile, Multi-user MIMO (MU-MIMO) beamforming, high-speed enterprise access points. 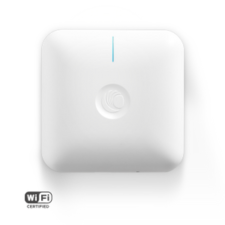 cnPilot Indoor APs are perfect for schools, malls, hotels, coffee shops, multi-dwelling units (MDUs), or any indoor environment that needs reliable, high performing educational or business wireless internet with high user capacity. No controller. No expensive licensing fees - just seamless controller-less roaming for up to 1,000 clients. Create fast guest access features with semi-customized splash pages, and time- and rate-limited access. Access options like social login and vouchers available with purchase are ideal for guest WiFi in hotels, coffee shops, and offices. Notes: The plenum-rated E410 with 2x2 MIMO packs a max transmit power of 25 dBm and is DFS certified to utilize additional reserved 5 GHz DFS channels – offering more flexibility than ever for both coverage and capacity.